Round 16 was the lowest scoring round of the year. 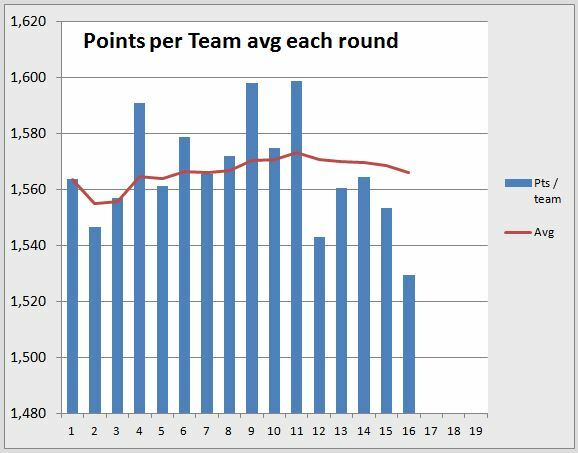 This equates to about 600 points less scored than a normal 18 team round of 28,000 points. But 600 points down isn’t that huge. However, the total number of hundreds shows a significant fall this round. In a normal 18 team round we should see about 63 hundreds. However this round we only had 45 hundreds, around 30% less than normal. To put this in perspective the Bye rounds with only 12 teams playing each week had 41, 49 and 45 hundreds. So Round 16 had as many tons as a bye round, even though 6 more teams played than a bye round. So coaches should stay away from the ‘delete team’ button; you aren’t alone having a bad score. The odds are that scores will be much higher this week. The biggest point of interest from individual games was Hawthorn’s shocker. They are normally a high scoring team and quite stingy themselves. However, they gave North over 1,800 points and Hawthorn only scored 1,387 points themselves. The next group down to West Coast are all close together and swap around a bit. If we ranked it on hundreds Collingwood and North would be green teams. Conversely teams with low ratios such as Melbourne, St.Kilda and Carlton will be less consistent producers of tons. At the top of the ladder St.Kilda is starting to move clear of Brisbane as the most generous team. West Coast, GWS, North and Melbourne are the next 4. 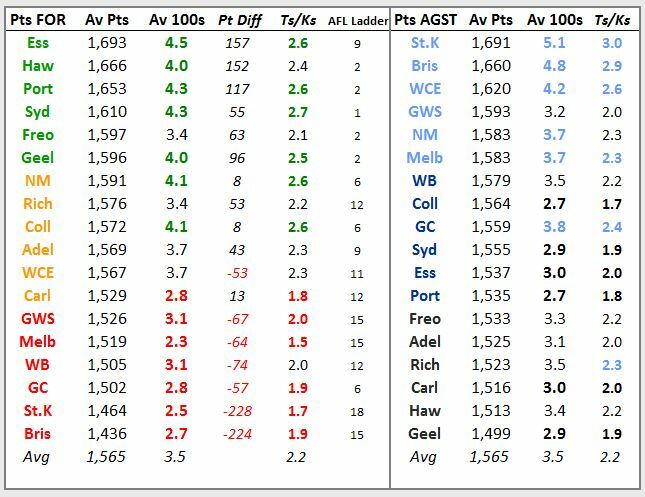 If we ranked the standings on 100s conceded GWS would be close to a black team. Gold Coast would be a blue sky team. 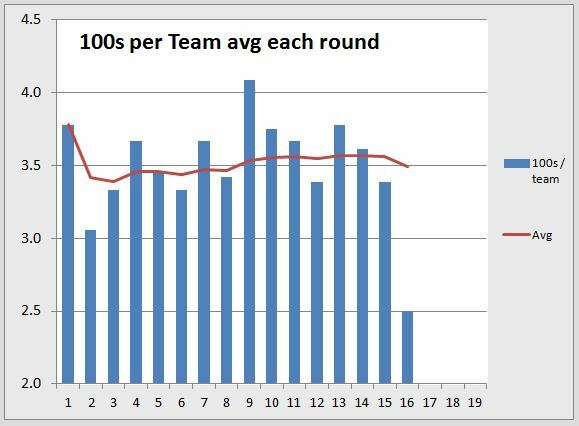 Collingwood and Port would be at the bottom of the standings having conceded the least amount of hundreds. Hawthon and Geelong and Carlton remain the least generous teams. 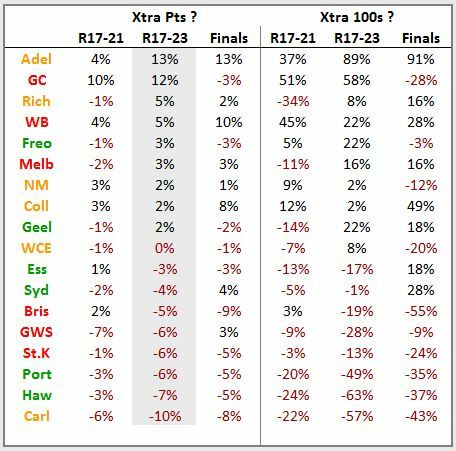 Conversely games against Collingwood, Port, Sydney and Geelong, with the lowest Ts/Ks ratios should be treated with caution. So which premiums should we bring in that will go straight to the head of the table and start carving? Also which of our non-keeper players with questionable appetites might struggle when faced with a few weeks of slimmer pickings? 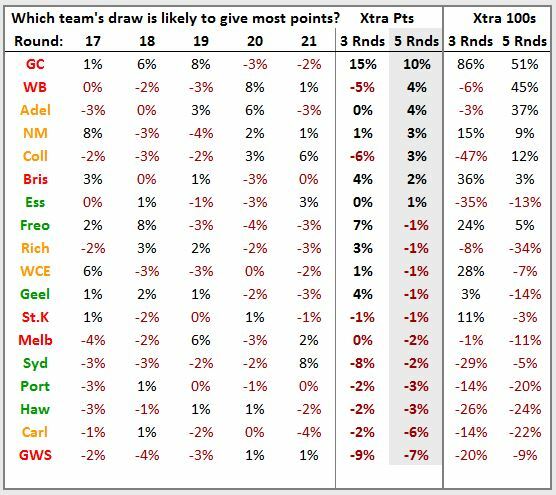 The following table shows which teams are likely to get extra (or less) points compared to if they played the average team. Gold Coast have moved to the top and this might assist coaches who have Suns players on the fringes of their teams. With 3 good games coming we can only dream about what might have happened if Ablett had not been injured. After scoring 1,800+ points against stingy Hawthorn, North could go very big against the most generous team St.Kilda this week. Essendon, Freo and Geelong are the best of the green teams. Sydney, Port and Hawthorn are towards the bottom. Collingwood and Adelaide are others with good runs coming. Adelaide are locked in at the top. 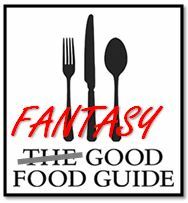 Although their fantasy relevant players aren’t getting the job done at the moment. Gold Coast, Richmond and Freo are next. Freo and Geelong are best of the high scoring green teams. Other green teams Port and Hawthon are towards the bottom of the table. I expect most coaches will be forced to trade to cope with midfield outs – Ablett, Rockliff and Goddard. Then there are new DPPs to consider; and that is without any new headaches from team selection. For those of you who do get a luxury trade soon, I traded in Ben Brown last week. He is a ruck forward DPP currently valued at $151k. With him and Lowden I’ve got my ruck bench capital down to 23% of the total ruck squad capital. If I need a spare ruck to play I can DPP him with Stephan Martin, otherwise he can sit on my bench freeing up money to use elsewhere. He scored 67 last week which is OK for a low value emergency if there is a late out. His JS may not be that great, but they play St.Kilda this week. I doubt North will play Daw in the seniors while he is under investigation. Based on this should I be getting Libba over Stevie ?